2015 is here and I am feeling extremely hopeful! There are so many things that I would like to accomplish. I feel like I have been given a new beginning, a fresh start. A reset button has been pressed and I am ready to set out on bold adventures. I can't wait to create opportunities where there were only set-backs. I am brimming at the chance to walk freely into my destiny and eliminate existing barriers. I leave my failed endeavors in 2014 and venture into more attempts in 2015. I may not get there this year, but I will have the satisfaction of knowing that I have another chance at working on my areas of opportunities. I can't wait to see what new surprises are around the bend. I have made my resolutions, goals and plans for this year. By now, I have learned to expect detours and delays in life. I am willing to be more flexible, more patient and to live in the moment. After all, it's not how fast I get to my destination, it's the experiences along the way that will shape my feelings and perceptions when I finally reach my destination. In 2015, I will set forth my plans and simply be "in the moment". 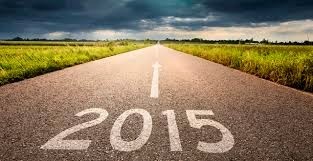 Divas and Divos, let us begin 2015 by moving onward and upward!